Order one for each NV office and location to be fully compliant. The 2019 All-In-One Labor Law Poster will include the following state & federal required posters for all businesses into one laminated 25.5" x 39.5" poster. 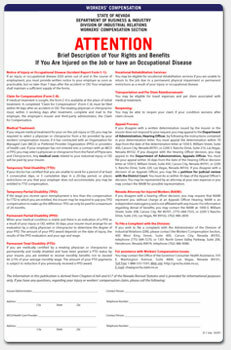 The OSHA poster is included on the Nevada Complete Labor Law Poster. When you order the Nevada Complete Labor Law Poster, it will satisfy your State, Federal, and OSHA posting requirements with one poster. 03/2019 - Minimum Wage & Daily Overtime Bulletins - Updated to reflect a 2019 bulletin date as well as the new director. 08/2018 - Workers' Compensation - Revised with new information on where to file a Workers Compensation claim as well as new font requirements. 08/2018 - Minimum Wage Rules to be Observed - More information added about domestic workers and their exemptions to the break and hour laws. 05/2018 - Minimum Wage & Daily Overtime Bulletins - Update includes changes to office address, contact info and new director information. Poster also reflects current calendar year of 2018. 07/2017 - Domestic Violence Victims Bulletin - Effective January 1, 2018 employees who are direct or indirect victims of domestic violence will be eligible for 160 hours of leave to deal with related issues. 07/2017 - Nursing Mother's Accommodation Act - Effective July 1, 2017 Nevada employers are required to provide break time and private location in order for mothers to express milk for children 12 months and younger. 07/2017 - Pregnant Workers' Fairness Act - New poster requirement for Nevada employers effective October 1, 2017 prohibits discrimination against employees based on pregnancy, childbirth, or a related medical condition. 01/2019 - Domestic Violence Victims Bulletin - Removed the Exceptions section of the notice and added new governor and director names to the notice. 04/2015 - Minimum Wage Poster - Minor update includes format changes to office address, new commissioner info and poster reflects current calendar year of 2015 w/o changes to min. wage rate. 04/2015 - Daily Overtime - Minor update includes format changes to office address, new commissioner info and poster reflects current calendar year of 2015 w/o changes to min. wage rate. 03/2015 - Minimum Wage Poster - Minor update with omission of governor, commissioner, and director names. 03/2015 - Discrimination - Minor update to office address. 05/2014 - Unemployment Insurance - Update to Unemployment Insurance poster, changes were new info on where to report Fraud & new website listing. 04/2014 - Minimum Wage Poster - Annual Bulletin - Updated to reflect the latest bulletin released April 1, 2014. Rates did not increase. 04/2014 - Daily Overtime - Annual Bulletin - Updated to reflect the latest bulletin released April 1, 2014. Rates did not increase. 01/2014 - Discrimination Notice Poster - Update includes new office address and age specific discrimination guidelines. Many industries such as the restaurant, retail, construction, and professional use the Nevada Complete Labor Law Poster to satisfy their compliance requirements for State, Federal, and OSHA. When posted in an area frequented by employees, the Nevada Complete Labor Law Poster puts a business in full compliance. Federal contractors and subcontractors are required to display more postings in addition to the general State, Federal, and OSHA regulations. Please click here to see the federal contractor and subcontractor posting requirements. Ensure your full compliance by posting the Nevada Complete Labor Law Posters with the federal contractor-required postings.